Ocean Alexander Yachts was born in 1977 with a mission to create the highest-integrity and superior-quality motor yachts on the water. 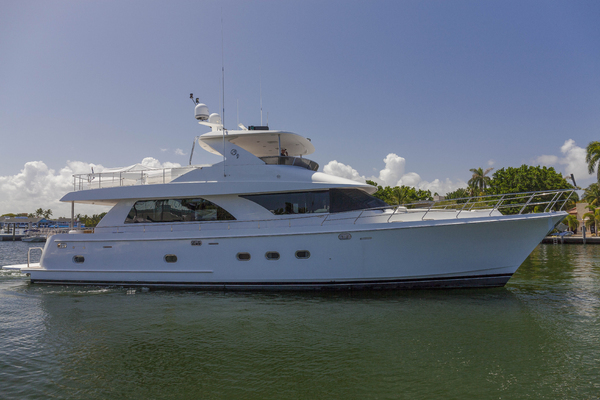 The brokerage team at United Yacht Sales has the experience to help guide you through the process of finding the perfect used Ocean Alexander yacht for sale on the market today. Born in 1877, Ocean Alexander Yachts were built to maintain revolutionary ideas, astonishing beauty and luxury, while always keeping high engineering principles in mind. Alex Chueh gave his name to the brand that eventually turned into one of the highest demanding and respected names in the industry. Today, the first boats he produced now sell for triple the original amount. As years passed, Alex’s son, Johnny Chueh, took over direction on Ocean Alexander Yachts and continued the building process, creating strong alliances with the finest architects and designers in the world to ensure the brand was in good hands. Ocean Alexander has built its early Taiwan roots into the US manufacturing world by expanding their skills and eventually becoming a top of the line brand. Ocean Alexander’s engineering has always been a priority, approaching it with safety and performance, but with no compromises. With today’s fast and evolving technology, there is no room for error. Ocean Alexander ensures that they stay at the leading edge of technology by keeping up and innovating today’s designs and components – which can be seen in every inch of their boats. Built with aluminum I-beams, these yachts are ten times stiffer than any wood or fiberglass built vessel obtaining extremely high strength-to-weight ratio for maneuverability, safety, and accuracy. Designed with Finite Element Analysis (FEA) allows for builders to solve potential structural or performance issues well in advance before actual construction takes place. Not only are these vessels built in a smart manner, but also include a distinctive look – oval-shaped stainless-steel deck rails are a classic feature of Ocean Alexanders, making it easier to grip and ensuring a safe ride. Another notable feature of this brand is the sophisticated vibration-isolation system for engines – making it sound as if no engine was actually running. Their leading edge sound-insulation technology proves itself every time you leave the dock. Ocean Alexander has taken the next step in designing their supreme yachts by partnering up with Evan K. Marshall, an American designer, who has led the brand to building the most beautiful yachts. The rich elements that exude from these vessels make this brand an alluring one by creating the highest-integrity and superior-quality yachts on the water. Ocean Alexander Yachts are indeed livable, high-tech, and made to be loved by any boat-goer. One of the newest of it’s the fleet; the new 120 Mega yacht features a tri-deck arrangement that can accommodate any party wanting an adventure on the water. This award winning yacht is a result of a collaboration that came from out-of-the-box thinking by combining innovative engineering techniques and high-end design. 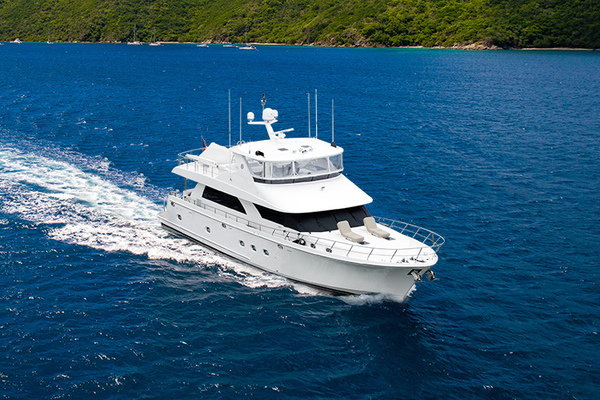 Providing sufficient space for up to ten people, this vessel also includes extraordinary privacy, quiet, and luxury. A private stairwell near the saloon leads to a foyer on the lower deck, which includes four large staterooms, while the master sits on-deck – each with its own distinctive guest experience, including private heads, media arrangements, and unique cabinetry and stonework throughout the rooms. Another notable feature is the beach club adjacent to the swim platform, which provides ample luxurious space for guests to lounge on while also enjoying the water. The high level of craftsmanship can be seen throughout the vessel by creating vertical windows and port lights, which allow natural lighting. The main deck has a spacious amount of space that creates a feeling of openness making the yacht feel in fact larger than 120 feet. Curved sliding doors and full-height windows make it seem as if you are sitting right on top of the water. The galley includes a large dinette, with airy counter space making it look like a chef designed the kitchen himself. The upper deck feels as if it was a private club, featuring a sky lounge, wraparound couch, and alfresco seating, including dining tables on both the main and bridge afterdecks. The 120 is no stranger when it comes to luxury and it can be seen in every element of this vessel. Built with privacy, luxury, and intimate entertaining in mind, the 112 Mega Yacht beautifully represents the true alliance between Evan K. Marshall and Ocean Alexander. The 112’ provides comparable amenities, luxuries and appointments one would expect to see in a custom motor yacht 20-30’ larger. This yacht creates compliant space that is well used for enjoyment through efficient engineering and detailed ergonomic design. 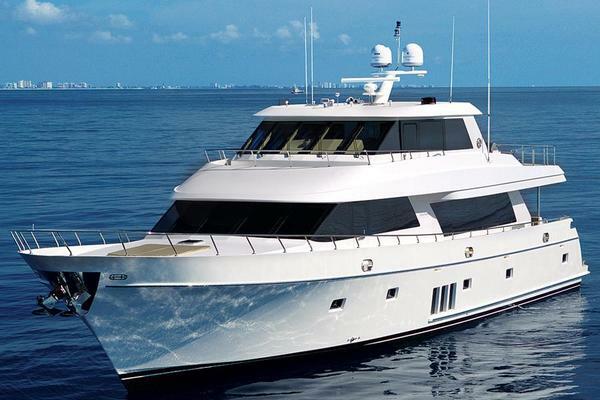 The tri-deck configuration offers an accommodation deck, main deck, bridge deck, and observation deck making this vessel well balanced and luxurious. Upon entering the main cabin, large, full-sized windows fill the room letting a massive amount of light throughout the space. Full formal dining is located just forward of the salon, while the galley incorporates granite or marble surfaces making the space welcoming for both crew and guests. The master stateroom that sits on the main deck is undoubtedly the room with the best view having a four-part windshield and having windows the same size as those in the salon. Not only does the interior provide magnificent details, but also the exterior shows the real makings of a luxury yacht. Solid wood planks are featured throughout the deck as well as having an aft deck providing ample room for the loading and staging of luggage, gear and supplies. 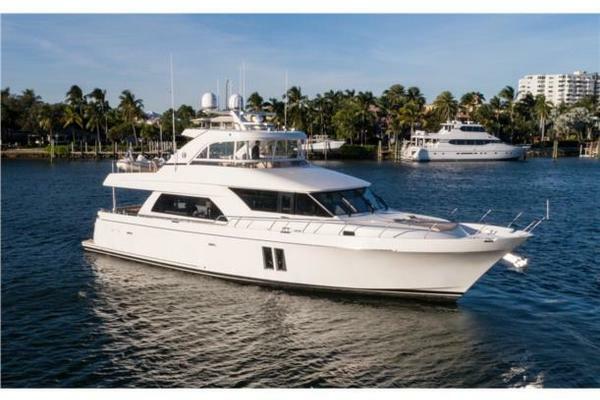 The flybridge can also be utilized for stowage as well as being the perfect spot for entertaining and sunbathing by having a covered bar and grill, full dining settee, and outdoor galley – not to mention the Jacuzzi just a few steps above. The functionality of design and efficiency that is demonstrated by both Marshall and Ocean Alexander is a pleasant combination and this yacht shows it. The 85’ redefines motor yachts by combining semi-displacement hull design with modern elegance. Her interiors provide a profusion of light making this vessel perfect for those wanting a private weekend getaways. 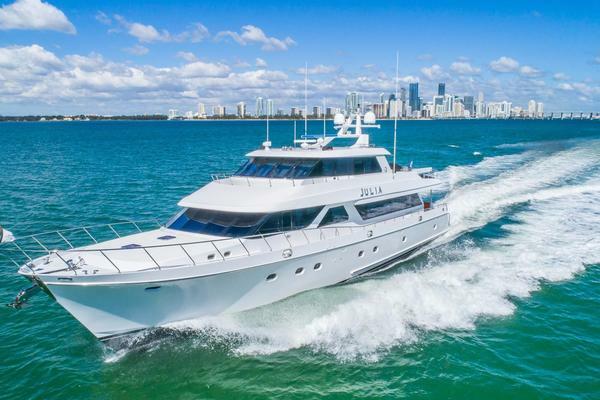 The beauty can be seen in the details by featuring four staterooms, four private heads, a separate saloon and dining area, a kitchen outfitted with plenty of counter space, high-end appliances, and a comfortable dinette. 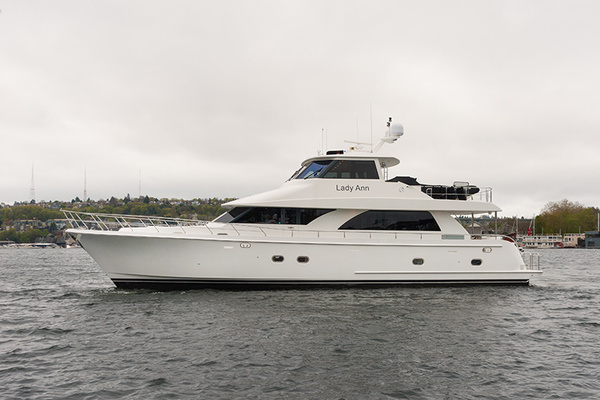 Well-engineered internal systems make this vessel the best in its class, making this yacht have a smooth, quiet ride. The 85 marks a new era in design while still complying with Ocean Alexander’s classic features. Exemplifying astonishing power, while still promoting luxury and advanced design, the 70’ Motor Yacht is a true model of Ocean Alexander’s brand. This vessel has done a masterful job creating a boat that features stability, safety and fine engineering. Modern exterior lines feature European superstructure qualities, while still maintaining classic-yacht aesthetic. The cockpit includes a settee with table, plus a fully stocked entertainment area within the salon, while the lovely galley sits just forward. Big-boat thinking is also carried throughout the lower deck, by designing four staterooms served by three heads. The master suite includes full beam and oversized windows providing ample light as if you were staying in a luxury hotel. This yacht highlights evolution at is finest by combining modern sensibilities with classic features, and high-tech engineering.